Disney still believes in their black-and-neon franchise and they’re moving forward with the new animated series TRON: Uprising. The series will air on Disney in summer 2012 and cover the events between the original TRON and Legacy. A teaser trailer for the series has gone online and if you loved TRON: Legacy, then you will probably love this too. It has light cycles and stuff. It features an impressive voice cast that includes Elijah Wood as Beck, Emmanuelle Chriqui as Paige, Mandy Moore as Mara, Paul Reubens as Pavel, Reginald VelJohnson as Able, Lance Henriksen as Tesler and a geek touch with Bruce Boxleitner reprising his role as Tron. 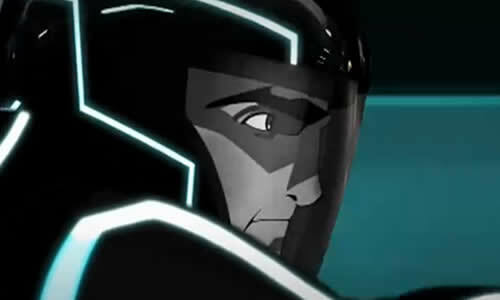 Produced by Disney Television Animation, the series follows Beck, a young program who becomes the unlikely leader of a revolution inside the computer world of The Grid. His mission is to free his home and friends from the reign of the villainous Clu and his henchman General Tesler. Beck will be trained by Tron, the greatest warrior the Grid has ever known. Tron will not only teach Beck the fighting skills he needs to challenge this brutal military occupation, but will be a guide and mentor to him as he grows beyond his youthful, impulsive nature into a courageous, powerful leader. Destined to become the new protector of the system, Beck adopts Tron’s persona and becomes the archenemy of Tesler and his oppressive forces.